Developer Economics is the leading research program on mobile developers and the app economy, tracking developer experiences across platforms, revenues and revenue models, apps, dev tools, APIs, segments and regions. 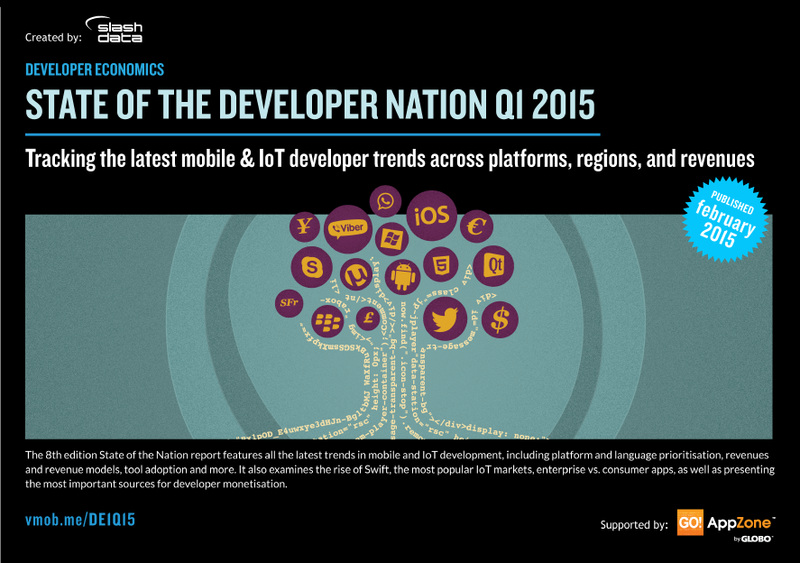 The 8th edition State of the Nation report features all the latest trends in mobile and IoT development, including platform and language prioritisation, revenues and revenue models, tool adoption and more. It also examines the rise of Swift, the most popular IoT markets, enterprise vs. consumer apps, as well as presenting the most important sources for developer monetisation. What is the global vs. regional developer Mindshare? Which are the most popular programming languages? What is the breakdown of Swift developers? Are app economy revenues polarising? What do developer revenues look like by platform and region? Which are the most popular IoT markets? Which devs are interested in IoT? What is the total tool adoption and breakdown by platform? Which are the most popular user analytics tools? What are the top app categories, platforms and revenue breakdown for enterprises vs consumers? What motivates developers? What platforms appeal to developers based on their motivation? What is the outlook of the app economy in 2015? Which business model dominates revenue forecasts? Developer Economics 8th edition reached an impressive 8,000+ respondents from 143 countries around the world. As such, it is the most global ever research on app developers and trends in app development. This report is based on a large-scale online developer survey and one-to-one interviews with mobile app developers. The online survey was designed, produced and carried out by SlashData over a period of five weeks between October and November 2014. One-to-one interviews were conducted in December 2014 and January 2015. Respondents to the online survey came from over 143 countries, including major app development hotspots such as the US, China, India, Israel, UK and Russia and stretching all the way to Kenya, Brazil and Jordan. The geographic reach of this survey is truly reflective of the global scale of the mobile app economy. The online survey was translated in 6 languages (Chinese, Portuguese, Japanese, Korean, Russian, Spanish) and promoted by more than 68 regional and media partners within the app development industry. Stalemate in the platform wars?